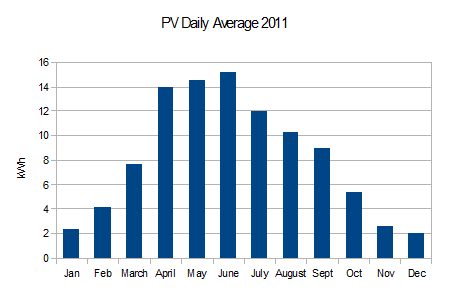 We are thinking of buying a domestic storage battery to better exploit our PV panels. They already generate more electricity than we use over the course of a year (see graph below), but that doesn’t mean we have sustainable electricity supply. As everyone – except for its more rabid proponents – realises, renewable electricity cannot satisfy peak demand reliably, and, because we therefore need other more constant sources of power, it is often wasted during demand troughs. A battery would at least ensure that for a lot of the summer our PV could provide all our electricity and reduce peak demand on the grid. For much of the winter, of course, it won’t, though if our domestic battery also re-charges itself overnight in the winter, when demand is low, that can at least reduce peak demand. This makes better use of renewable capacity elsewhere, so is worth doing if we can afford it. At present, the financial incentive to install a home battery is marginal for most people, although that will change as batteries become cheaper. If we just used our battery to shift our entire grid demand to night time Economy 7 electricity, our bill would come down from £334 to £222 a year, simply because we would be paying for all our electricity at night time rates. Being able to transfer any summer daytime surplus PV for evening use will reduce our bill, and our peak grid demand, even further. Despite the fact that we generate more electricity over the course of a year than we use, we can’t achieve grid independence with a battery only able to hold a day or two’s demand. A battery big enough to carry our summer surplus over to the winter would probably require planning permission, which is difficult for residents of a National Park. Plus it would offer fairly poor return on the huge capital outlay. But I am persuaded that transition to totally renewable electricity generation is going to require fairly substantial storage to make full use of intermittent generation. Some of this will probably need to be done at the supply end – for example by schemes like the Dinorwig pumped storage scheme, or adding storage to solar and wind farms. Those might require some incentive to attract the necessary investment. But storage can play a useful role at the demand end – batteries in domestic and commercial premises can effectively smooth the spiky grid demand curve and smart metering and dynamic tariffs can encourage charging strategies that take maximum advantage of renewable energy gluts. Here are some further thoughts on the topic. This entry was posted in Technology and tagged Energy Storage, Renewable, solar PV. Bookmark the permalink.